Avere OS’s FlashMove® and FlashMirror® features help you move and copy data from one file location to another, including from one core filer to another. They allow the Avere cluster to act as a controller for migrating data among various storage components. FlashMove lets you migrate data between storage systems without interrupting client access or having to change any client settings. 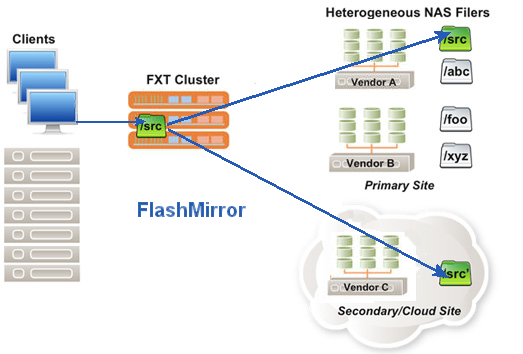 FlashMirror provides ongoing synchronous data replication between two back-end storage systems for data protection. Avere OS’s Data Management features can move data between storage systems from different providers that use different technologies, as long as each system can be defined as a core filer in the Avere cluster. Additional licenses are required to enable the FlashMove and FlashMirror features. Read Appendix A: Adding or Removing Feature Licenses to learn how to purchase and install the licenses. Create and monitor data migration jobs from the Data Management tab in the Avere Control Panel. FlashMove copies the contents of a specified file tree from one core filer to another. If the original location was accessed through the Avere cluster, FlashMove automatically changes settings so that the Avere cluster uses the new storage location instead of the old location. Because clients access the data through the Avere cluster instead of on the storage volume itself, FlashMove can migrate data while it is in use, and with no need to modify client applications. During the move, the data is continuously available through the Avere cluster junction. Clients can view and change data, and Avere OS automatically keeps the data synchronized as part of the move. After the data is completely copied to the Vendor C core filer, the cluster modifies the junction so that it references the new location of the moved files. That is, when a client application writes data to <cluster>/src, that data is stored on the back end in <Vendor C>/src. This process also can be used between multiple exports on one core filer, and between hardware storage and cloud object stores. Because FlashMove can migrate data without affecting client access, it gives you the flexibility to use a variety of storage solutions to maximize effectiveness and cost savings. Read FlashMove In Depth for a detailed discussion of the FlashMove process. Like FlashMove, FlashMirror also copies the contents of a filesystem from one core filer to another. However, after the initial copying is finished, FlashMirror keeps the primary and secondary filesystems synchronized with each other as clients make changes. Clients continue to access their files through the cluster, and any changes are written to both the original location and the mirror location. The cluster has an active FlashMirror job that copies the data stored in <Vendor A>/src to <Vendor C>/src. As clients change the data from the cluster, both locations are updated and kept synchronized. If the primary storage system becomes unavailable, you can transition the mirror, which changes the namespace junction to point to the secondary filesystem. This transition is seamless for clients. The mirror also can be reversed - for example, if you need to take the primary system out of service for maintenance, you can change the secondary system to be the primary system and allow the mirror to go out of sync until the other volume is back in service. When the other system comes back online, changes are automatically synchronized to that volume again, since it is now the secondary in the mirror system. You have the option to continue the mirror with the current primary/secondary setup, or reverse the mirror again if you prefer to have the original source volume be the primary. FlashMove and FlashMirror operations can take place behind the scenes without any interruption in client file access because of Avere OS’s Global Namespace (GNS) feature. When you move data with FlashMove or FlashMirror, Avere OS automatically updates the namespace mappings so that the junctions point to a different physical storage volume.